Recent research shows that women and girls are keen to build their sporting talent and to improve their health and fitness through sport and active recreation. However, it remains difficult for women and girls to equally participate in sport. Many women and girls struggle to find support to pursue sport and the sporting skills and ambitions of girls and women are often not taken seriously by those around them. As these examples show, coverage of women’s sport is frequently sexist and there is often a greater focus on what women look like, rather than what they can do. Read this short explainer about some of the barriers to women’s equal participation in sport and this brilliant piece exploring sexism in sport (written by a year 12 student!). Watch this clip and this clip to learn more about the challenges girls and women face when trying to pursue the sports they love. Through sports we can all learn more about the values of fairness, inclusion, camaraderie and respect. Aside from offering health and community strengthening benefits, sport has the potential to influence social attitudes and challenge rigid and limiting gender stereotypes, roles and expectations. By challenging sexism in sport we can create inclusive, equitable, healthy and safe environments for women and men, girls and boys. 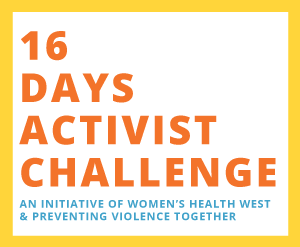 All of this helps to prevent violence against women (Our Watch). Celebrate Change Our Game’s International Day of the Girl.